"CoCl2" redirects here. For the compound COCl2, see Phosgene. 2. It is a sky blue crystalline solid. 2O, which is one of the most commonly used cobalt compounds in the lab. Because of the ease of the hydration/dehydration reaction, and the resulting color change, cobalt chloride is used as an indicator for water in desiccants. Niche uses of cobalt chloride include its role in organic synthesis and electroplating objects with cobalt metal. Cobalt chloride has been classified as a substance of very high concern by the European Chemicals Agency as it is a suspected carcinogen. 2 structure (R3m) in which the cobalt(II) ions are octahedrally coordinated. At about 706 C (20 degrees below the melting point), the coordination is believed to change to tetrahedral. The vapor pressure has been reported as 7.6 mm Hg at the melting point. 2 in water is about 54% at the boiling point, 120.2 °C; 48% at 51.25 °C; 35% at 25 °C; 33% at 0 °C; and 29% at −27.8 °C. , besides chloride ions. Concentrated solutions are red at room temperature but become blue at higher temperatures. 4 and two molecules of water of crystallization. This species dissolves readily in water and alcohol. The anhydrous salt is hygroscopic and the hexahydrate is deliquescent. The solid dihydrate and hexahydrate can be obtained by evaporation. Cooling saturated aqueous solutions yields the dihydrate between 120.2 °C and 51.25 °C, and the hexahydrate below 51.25 °C. Water ice, rather than cobalt chloride, will crystallize from solutions with concentration below 29%. The monohydrate and the anhydrous forms can be obtained by cooling solutions only under high pressure, above 206 °C and 335 °C, respectively. The anhydrous compound can be prepared by heating the hydrates. On rapid heating or in a closed container, each of the 6-, 2-, and 1- hydrates partially melts into a mixture of the next lower hydrate and a saturated solution -- at 51.25 °C, 206 °C, and 335 °C, respectively. On slow heating in an open container, water evaporates out of each of the solid 6-, 2-, and 1- hydrates, leaving the next lower hydrate -- at about 40 °C, 89 °C, and 126 °C, respectively. The anhydrous compound can be purified by sublimation in vacuum. 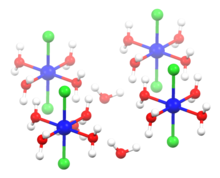 The [CoCl4]2− ion is the blue ion that forms upon addition of hydrochloric acid to aqueous solutions of hydrated cobalt chloride, which are pink. 2 substituted for atmospheric oxygen. Other highly basic ligands, including carbonate, acetylacetonate, and oxalate, induce the formation of Co(III) derivatives. Simple carboxylates and halides do not. Unlike Co(II) complexes, Co(III) complexes are very slow to exchange ligands, so they are said to be kinetically inert. The German chemist Alfred Werner was awarded the Nobel prize in 1913 for his studies on a series of these cobalt(III) compounds, work that led to an understanding of the structures of such coordination compounds. 2·THF in pentane produces the brown, thermally stable cobalt(IV) tetralkyl — a rare example of a stable transition metal/saturated alkane compound, different products are obtained in other solvents. In 2005–06, cobalt chloride was the eighth-most-prevalent allergen in patch tests (8.4%). Invisible ink: when suspended in solution, cobalt(II) chloride can be made to appear invisible on a surface; when that same surface is subsequently exposed to significant heat (such as from a handheld heat gun or lighter) the ink permanently/ irreversibly changes to blue. Cobalt chloride is an established chemical inducer of hypoxia-like responses such as erythropoiesis. Cobalt supplementation is not banned and therefore would not be detected by current anti-doping testing. Cobalt chloride is a banned substance under the Australian Thoroughbred Racing Board. ^ "Cobalt muriate, CAS Number: 7646-79-9". www.chemindustry.com. Retrieved 19 April 2018. 2O" Journal of Thermal Analysis, volume 11, issue 1, pages 87–100. doi:10.1007/BF02104087 Note: the lowest point of fig.6 is inconsistent with fig.7; probably should be at -27.8 C instead of 0 C.
^ a b Greenwood, Norman N.; Earnshaw, Alan (1997). Chemistry of the Elements (2nd ed.). Butterworth-Heinemann. ISBN 978-0-08-037941-8. ^ The Merck Index, 7th edition, Merck & Co, Rahway, New Jersey, USA, 1960. ^ Gill, N. S. & Taylor, F. B. (1967). "Tetrahalo Complexes of Dipositive Metals in the First Transition Series". Inorg. Synth. 9: 136–142. doi:10.1002/9780470132401.ch37. ^ Handbook of Chemistry and Physics, 71st edition, CRC Press, Ann Arbor, Michigan, 1990. ^ Barton K. Bower & Howard G. Tennent (1972). "Transition metal bicyclo[2.2.1]hept-1-yls". J. Am. Chem. Soc. 94 (7): 2512–2514. doi:10.1021/ja00762a056. ^ Erin K. Byrne; Darrin S. Richeson & Klaus H. Theopold (1986). "Tetrakis(1-norbornyl)cobalt, a low spin tetrahedral complex of a first row transition metal". J. Chem. Soc., Chem. Commun. (19): 1491–1492. doi:10.1039/C39860001491. ^ Erin K. Byrne; Klaus H. Theopold (1989). "Synthesis, characterization, and electron-transfer reactivity of norbornyl complexes of cobalt in unusually high oxidation states". J. Am. Chem. Soc. 111 (11): 3887–3896. doi:10.1021/ja00193a021. ^ Zug KA, Warshaw EM, Fowler JF Jr, Maibach HI, Belsito DL, Pratt MD, Sasseville D, Storrs FJ, Taylor JS, Mathias CG, Deleo VA, Rietschel RL, Marks J. Patch-test results of the North American Contact Dermatitis Group 2005–2006. Dermatitis. 2009 May–Jun;20(3):149-60. ^ Lippi G, Franchini M, Guidi GC (November 2005). "Cobalt chloride administration in athletes: a new perspective in blood doping?". Br J Sports Med. 39 (11): 872–3. doi:10.1136/bjsm.2005.019232. PMC 1725077. PMID 16244201. ^ Bartley, Patrick (6 February 2015). "Cobalt crisis turns the eyes of the world onto Australian racing". The Sydney Morning Herald. 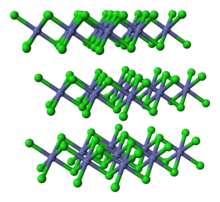 Wikimedia Commons has media related to cobalt(II) chloride. IARC Monograph "Cobalt and Cobalt Compounds"